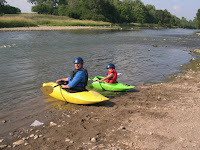 Josh's first whitewater kayak trip! 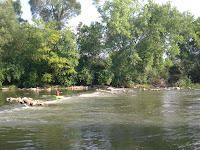 Allen took Josh out for his first ever "whitewater" trip down the Mad River. He hasn't really learned to embellish a story yet, but then he's only 7! Click here for more pics posted in the OAC gallery. Today, Dad took me to the White Water Warehouse and we rented a Jackson Fun 1. I met Eric Jackson once with my dad. 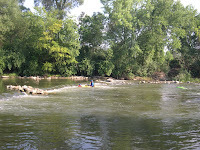 Then we went to the Mad River and put in at the bridge. 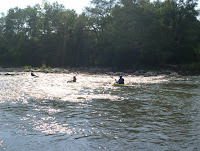 And then the first rapid I did not flip. That’s pretty much it. Then I went on some flat water. Then I got stuck in a bush and I screamed but then I pushed myself out and was fine. Then we got to Bernie’s Hole and mommy took pictures [only a few]. Then I went over Bernie’s Hole and flipped and got stuck in the hydraulic [seriously he said that] and I almost screamed my head off. Then my dad pulled me out. Then he pulled me to my boat and then I emptied my boat. Then I got back in my boat and went on down the river. There were some little waves and it was fun going over the waves. I was not scared this time. Then there was some more flat water and then there was a strainer but I went around it. Then there were some big rocks in the river in a rapid and I did some wicked moves around them [Allen said they really were wicked]. Then I accidentally did an eddy turn. That was the last rapid. Then we took out at the White Water Warehouse and went home. That’s it. Way to go Josh !!!! We're really proud of you and "stoked for ya dude". Maybe you can teach the girls some of your wicked moves when we come to visit.